Acclaimed Science Fiction Fantasy Adventure starring Julian Wadham, Jenny Agutter, Gethin Anthony, Lauren Crace, Paul Darrow, Sylvester McCoy and Paul McGann. Find out more at www.ministerofchance.com, on Facebook and follow us on Twitter @ministerchance. Series Finale: Following Lord Rathen's calamitous attack, the shell-shocked Kitty and The Minister attempt to salvage what they can. The Minister is driven to form risky and desperate allegiances, voyaging up the mythical River Hex to get help. Meanwhile, Cantha and Sunflower prepare for a suicide mission to end the War in the electrifying conclusion to the story. Learn more at https://www.facebook.com/theministerofchance and @ministerchance on Twitter, or www.ministerofchance.com. The Horseman finally catches up with The Minister and an injured Kitty on the Plain of Tombs in Paludin Fields. Meanwhile in Tanto, Professor Cantha and Sunflower spread the ancient knowledge of Science amongst the people of Tanto. In Sezuan, Durian's ambitions are realized with the help of the vicious Lord Rathen. Find out more at www.ministerofchance.com, facebook.com/theministerofchance, on Twitter @ministerchance - and there's also a spoiler chat group on Facebook for those who've heard all four Episodes. Tell your friends! The Minister and Kitty arrive in the strange and murderous marshes of Paludin Fields in search of the Sage of The Waves. Meanwhile, in Sezuan, Durian finally shows his hand. In the forests of Tanto, meanwhile, Professor Cantha sees the full extent of the Sezians' assault on Science. Find out more about the series at www.ministerofchance.com, facebook.com/theministerofchance and @ministerchance on Twitter. Ambassador Durian of Sezuan (Paul McGann) is dispatched to the primitive island nation of Tanto to talk peace. However, his offers of friendship to the belligerent King (Mark Lewis) fall on deaf ears, and things take a turn for the very, very sinister. Find out more at www.ministerofchance.com, on Facebook and on Twitter @ministerchance. And please leave us a review on iTunes! After her strange journey with The Minister, Kitty awakens in darkness, disorientated and alone... or maybe not. There are things moving in the dark, and perhaps not all of them human. Kitty awakens in darkness, disorientated and alone... or maybe not. There are things moving in the dark, and perhaps not all of them human. 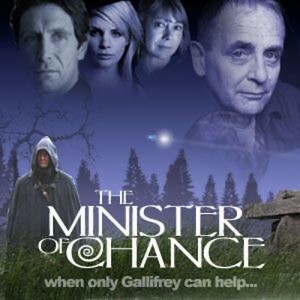 Find out more at www.ministerofchance.com, on Facebook and on Twitter @ministerchance. Kitty is a barmaid at the Traveller's Rest in the occupied city of Tantillion. Her normal activities (abusing customers, starting fights) are interrupted by the arrival of a stranger. Science is now outlawed, so when the stranger openly asks after a known scientist, Kitty's curiosity is piqued. Before she knows it, the entry of the stranger into her repetitive live finds her stealth-shouting, hit by a fireball and befriending the wrong creature. Find out more at www.ministerofchance.com, on Facebook and on Twitter @ministerchance. And please rate us on iTunes!